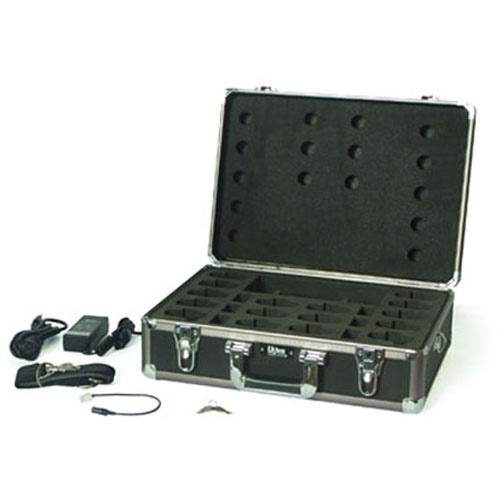 The Listen Tech 16-Unit Portable RF Product Charging/Carrying Case (North America) LA-311-01 is designed to store and charge up to 16 portable Listen RF products (LT-700, LR-200, LR-300, LR-400 or LR-500) Drop the units in the case, and they'll turn off automatically when fully charged. A power cable connects the case to a standard electrical outlet. It also has individual earphone storage slots to prevent cable tangling, and a large pocket to store the power supply, headsets, and/or additional items. The sleek, sturdy case has durable latches and includes a shoulder strap for easy transport. Use with NiMH batteries.